This week in Fossil Friday I have a specimen I’m particularly pleased to show you. It’s the holiday season—consider it a gift! 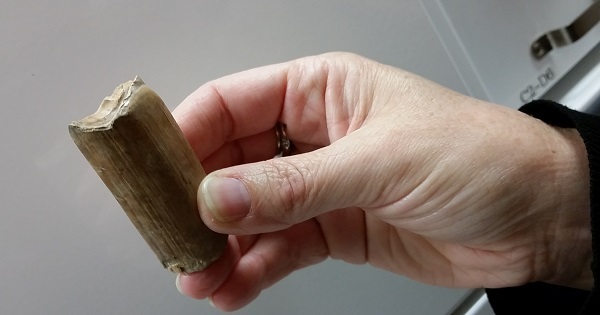 So what is this thing the University of Iowa fossil curator, Tiffany Adrain, is holding? This was a particularly nice specimen to touch: really smooth with distinct ridges, it felt almost like it had been carved and polished. Just one hint for identification: this fossil didn’t have to travel very far to make its home in the UIowa collections. Identify it in the comments and win bragging rights for the week!